You could make a convincing argument that no team in the NFL has a full franchise history more associated with one side of the ball than the Bears and defense. Teams mostly go back and forth, from average team to offense-heavy to defense-heavy and back again. But think back to the best Bears teams in the franchise history, and think back to its paltry quarterback roster over the years, and you’re going to land on that being a truly defense-heavy team. That’s not to say the team hasn’t had spurts of offense. Matt Forte was a spurt all on his own for a long stretch. But the point is that picking out the best fantasy seasons of the Bears’ last 10 years is less of a feat than it is for most of the league’s franchise. Let’s take a look at the best Bears fantasy seasons of the last decade. Trubisky’s season is the best one the Bears have had in the last decade — remarkably, it’s the best Bears QB season of all time — but it would only have led one other franchise in the league over the same span — and it probably wouldn’t take you very long to identify the Browns as that franchise. Trubisky had the single best QB fantasy game of the season in his Week 4 destruction of the Buccaneers (354 passing yards, 6 touchdowns) and was the league’s best fantasy quarterback on a points-per-game basis over an extended stretch, Weeks 4-10. 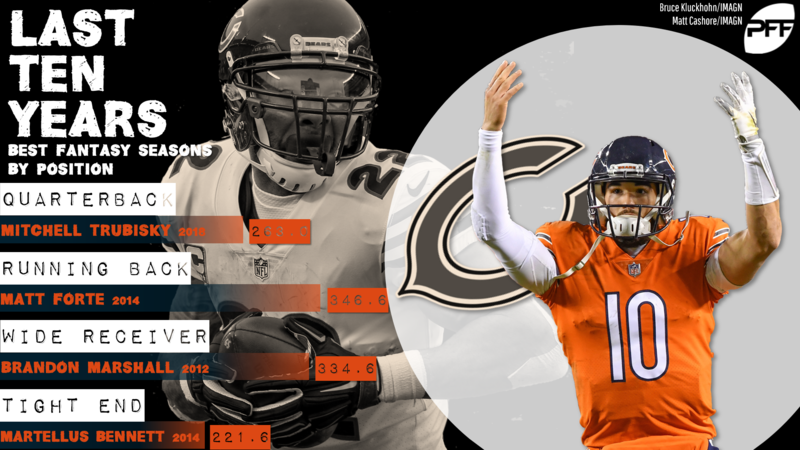 Injury and less effectiveness down the stretch kept Trubisky from rising higher on the list, but it’s still comfortably the best Bears QB season since 2009 (the next seven best all belong to Jay Cutler), and it just edges Erik Kramer’s 1995 for the team’s all-time title. You know how Betty White is the last surviving Golden Girl and has been for several years now? That has to be how Forte felt for a big part of his Bears tenure. He owns seven of the top nine Bears RB seasons, including the top three. But none were better than his 2014, when he set the all-time record for receptions by a running back until Christian McCaffrey ruined things for him in 2018. He was perpetually a fantasy bargain, often drafted as a low-end RB1 or high-end RB2 but finishing inside the top-12 every years of his Bears tenure. Marshall was the WR2 in that season, and it was the best Bears WR season, but it wasn’t Marshall’s best season, as he topped it with the Jets in 2015 (more on that later in this series). It came in Alshon Jeffery’s rookie year, and Jeffery didn’t really pop until his second season, so Marshall was in a very cheese-stands-along situation, and it showed — the second-best Bears receiver in 2012 was Jeffery himself, at only 78.7 PPR points. Marshall has topped 17 PPR points per game six times for three different teams in 13 seasons, and while it seems clear his run is over, it was a very long and very good one. Maybe this is just my perception, but it feels like Bennett got forgotten really quickly in the annals of fantasy performers. It’s true he was never on the level of Rob Gronkowski or Jimmy Graham, but he was a very good fantasy option for multiple years. And for the Bears, this was an easy pick for best fantasy season — the next-best was Greg Olsen’s 169.2 points in 2009. Bennett won’t be remembered as an all-timer by any means, but he might be underrated to history.